The Lawrence University Percussion Ensemble won the 2014 Percussive Arts Society’s World Percussion Ensemble Competition and will be a featured performer at the PAS international convention in November. The Lawrence University Percussion Ensemble (LUPÉ) will be among the featured performers at the Percussive Arts Society International Convention this November in Indianapolis, Ind., after winning the organization’s 2014 International World Percussion Ensemble Competition. LUPÉ — comprising the Sambistas, a Brazilian drumming corps, Kinkaviwo, a Ghanaian drum and dance group and Tambotoke´, an Afro-Cuban group — was selected the winner from among submitted video tapes. 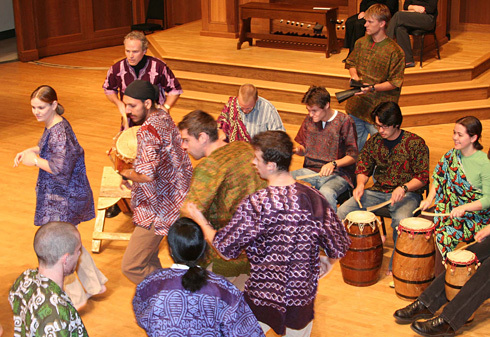 The annual PAS-sponsored World Percussion Competition is open to high school and college/university ensembles performing non-Western percussion-based music. Lawrence’s submission was from its March 2014 concert in the Lawrence Memorial Chapel. It is the second time LUPE has won a PAS international competition under the direction of Professor of Music Dane Richeson. LUPE won the 1995 PAS collegiate percussion ensemble competition and performed at its international conference in Phoenix that year. The Percussive Arts Society International Convention is the world’s largest percussion event, featuring more than 120 concerts, clinics, master classes, labs, workshops, panels and presentations. Lawrence will perform at the convention with winners in other categories of PAS-sponsored competitions, including ensembles from the University of Kentucky, Oklahoma State University and Yale University.